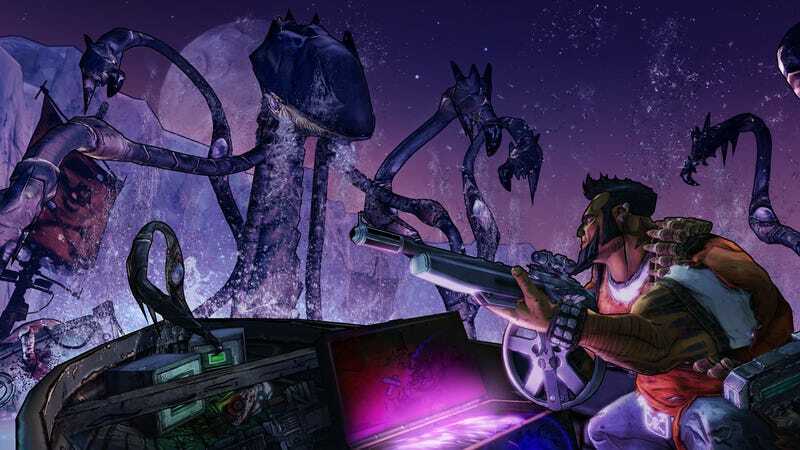 Borderlands 2 is a game that will keep you happily busy for some time. But if you want to experience all the game has to offer, you'll have to hunt after all the easter eggs and hidden secrets. And there are a lot. Here are just a few we've found. Let us know if you've discovered others because, knowing Gearbox, there certainly are more. Don't forget to click to expand images. If you don't want anything spoiled for you, feel free to stop reading right about now. Fight creepers and win a Minecraft-inspired head skin for your character in the Caustic Caverns. Learn how to do so here. Update: You can also pick up a Hyperion-manufactured weapon that shoots Minecraft arrows, as seen in XxTONYDATIG3RxX's video to your left. Update: Reader Brian sent in his Minecraft gun, which happens to be a shotgun. It also looks awesome. Mmm pizza. Pretend to deliver pizza to four mutants named Lee, Dan, Mick and Ralph. Kind of familiar, wouldn't you say? Game Front shows you where to find these color-coordinated mutants in the video to your left. Update: A couple of you pointed out that there's a hidden boss that you can release with four switches in a room near the mutant turtles. Here's a video that includes said boss—Flinter—a reference to Master Splinter. "Wise man say forgiveness is divine but never pay full price for late pizza.- Captain Picard"
You can see it in the image up above, thanks to The Childhood Improver. There's a shotgun in Borderlands 2 that's both a reference and homage to Fallout 3's Three Dog. The gun is called Thre Dog. Check it out in YouTube user DeltaVT's capture to your left. If you're curious where to find it, MorninAfterKill has the guide. Game Front comes to your aid yet again to find a special weapon called Neutralizing Gwen. Oh, and a female skull next to it. It's a reference to the famous last scene in Se7en, and Handsome Jack will even yell, "What's in the box? What's in the box?" as you open it. In the video is also a character named Loggins, a reference to Kenny Loggins whose "Danger Zone" was on the Top Gun soundtrack. He even mentions a "danger zone". Check out the video for both movie references. You can give Salvador Walter White's head with the "Breaking Bald" head skin. A Reddit user found it in the image you see to the left. "Fried gold" is a term used to call something awesome. It was used in both the British show Spaced as well as the Shaun of the Dead film. You can dress Maya up in the skin called Slice of Fried Gold that you see in the non-existent image below. (If you have one, lemme know!) Update: Thanks for the image callmeJackz! YouTube user TheLoyalJoe found a sign on a bandit outhouse that says "Dook Hut. No Fapping!" Fapping is Internet for masturbation. Game Front tells you how to find the double rainbow in the Highlands, referencing a man's admiration that turned meme. You even get an achievement for finding it, and listening to Handsome Jack reenact the excitement over a double rainbow. Reddit user recc113 found Solitaire, a reference to the Knight of the Sun Solaire in Dark Souls, hidden in Caustic Caverns. Game Front also has a video walkthrough of how to find this particular easter egg. If you talk to the citizens of Sanctuary, you'll hear a reference to the "arrow to the knee" meme born from Skyrim. Take a look at the video to the left courtesy of YouTube user TehEmerton. This one gets you an achievement if you can find and kill Donkey Mong, a rare bullymong enemy. Game Front to the rescue. Update: In addition to Donkey Mong, there's also King Mong, a play on King Kong. Though he won't grant you an achievement for killing him, but you can watch DirtyonXBL kill him in the video to the left. A big fan of Borderlands who sadly passed away at a very young age was immortalized in Borderlands 2. Game Front shows you where you can find his in-game character, where he will bestow a weapon to you, which you can grab for an achievement. Claptrap sings dubstep. For more wub wub. Found by Computer and Video Games, in the video to the left. Mad Moxxi will give you two weapons—Miss Moxxi's Good Touch and Miss Moxxi's Bad Touch—for tipping her $15k+ in Sanctuary. Gameranx tells you about the special vibrating features of the guns, and you can see them in the video to the left from YouTube user CookielMonsterr. Game Front spotted a reference to Nathan Fillion—star of the awesome Firefly—in Liar's Berg where there's a sign posted that says "Fillion's Ammunition and Arms." Another spot by Game Front is a badass challenge called "For the Hoard!" which is a familiar line often spoken by Blizzard's Horde creatures. YouTube user RifleGaming shows you a reference to Batman. You can encounter an enemy called Rakkman in The Fridge who lives in a batcave and throws smoke bombs and boomerangs for his attacks. You can pick up a a "Why so serious?" skin for Zer0 that references the Joker with his trademark color scheme. YouTube user EdwrdTriggaHnds shows it off to the left. The lovable meerkat and warthog duo featured in The Lion King are referenced in Borderlands 2 with these two enemies: a skag and a stalker. It's also a reference to the trailer Gearbox launched that featured the memorable music from the film that Timon and Pumbaa sang together. Found to your left by MrRhymestyle. If you tread the path carefully like XGeNReaL did here, you can stumble on four different hidden skins. It seems like the Medic Mantis and Metal Fear skins could be Metal Gear references. Zer0's Alienation skin could very well be an Aliens film reference, as it certainly looks that way. And my guess for Marshall Mustache is that it's either a How I Met Your Mother doppelganger or some Western-set game reference. John Marston? Eh, he had a full bear going on. Close enough? Apparently Roland and overly attached Lilith are in a relationship. I can hear hearts breaking everywhere. Thanks SlayrProductions. There are a few QR codes to find, but this one found by AngryL3perchaun is a cute message from one of the developers. Nick Wilson makes his appearance in a few others, too. This one found by FillerKillers. If you wander the Arid Badlands, you'll recognize some of the location as the starter zone from the first game. And you might be as excited as Warf3reHD and his friends were. You can hang with Huey, Dewey, and Louie from DuckTales. Well, almost. Hashtagaming found these three midgets that seem like a nudge to the ducks. YouTube user deathmule found Steve, the bandit that's been making his promotional rounds since Borderlands 1. Jimmy Jenkins is a mech enemy—the result of an accidental abomination—that you can kill to complete a challenge. Watch xXEVILMONKEYX kill the loader in the video to your left. Update: You guys have been throwing secrets out there, so I've gone ahead and added them to the list. Kudos to you all. TehCodehzor stumbled on Laney White and her seven dwarf (known as midgets in the Borderlands universe) minions. You can see Sleazy, Dirty, Tipsy, Crabby, Bloody, Greedy and Creepy in the video to your left. Several of you have pointed out that a citizen in Sanctuary will say, "Winter is coming" when you speak with them. That's a reference to Game of Thrones. A certain quest you turn in to Mad Moxxi will give you a shotgun with a description that says, "I don't want to set the world on fire." This is a reference to a song that belongs to Fallout 3's soundtrack. Mạnh Quân Nguyễn found the image of the gun that you can see to the left. Here's a reference to several eras of Dr. Who actors. Thanks for the image, Hadrian Mosley and RealNaezwood! xXEVILMONKEYX gives you a tutorial on how to get a Daft Punk helmet skin. Yet another skin for Zer0 is this reference to Battletoads. OMFG Network has a bunch of Zer0's appearance options for you to sort through. Thanks to reader Joshua, we have this clip to your left of the "I Blue Myself' skin, which is a reference to Arrested Development. Similar to the first Borderlands, you can shoot a bunch of barrels to engage a fish show. GameFront has the spectacle in the video to your left. If you complete Ellie's "Wakey Wakey" quest, you can choose from two rewards, seen to your left, that reference Veritas Aequitas, the MacManus brothers' motto that they have tattooed on their fingers. Thanks reader SRSFACE! GameFront has discovered yet another easter egg, where you'll meet Gollum. Sort of. And you'll also get lots of loot, in Borderlands' typical fashion. DomesticDiscount stumbled on this little secret, where you can unlock wub wubs with the Konami code. Granted, it does absolutely nothing. Look to your left, and thanks to reader 8vturbo for pointing us to EGM's discovery of said useless secret. I'll keep adding in more secrets and easter eggs as we/you find them.